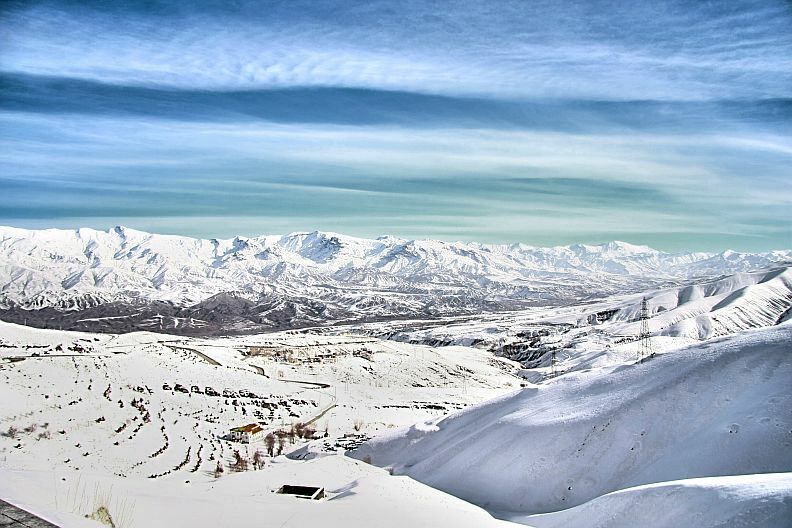 The Alborz (or Elburz) is a range of mountains in northern Iran. The range is almost 600 miles long, and varies in width from about 19 to 81 miles, and is located south of the Caspian Sea. The highest mountain in the range located in northern Iran is Mount Damavand at 18,406 ft. (5,610 m.). The mountains consist mostly of limestone with lava beds and volcanic tuff. The region is divided into two climatic zones. The northern region has an average annual rainfall of 39.4 inches in the lowlands and more in the mountains. The region contains forests of beech, oak and cypress. The southern region is much drier, with an average annual rainfall of 11 to 20 inches. The vegetation is sparse, although some juniper forests do exist here.